2,900. That’s the average number of dryer vent fires caused by clogged dryer vents and ducts that occur each year, according to the U.S. Fire Administration. Of those 2,900 dryer vent fires, a hefty amount of property loss, injuries and even death can occur. What causes these fires and how can they be prevented? After a load in the dryer is finished, many of us remember to remove the fuzzy layer of lint from the lint trap. What most of us don’t know is that this simply is not enough to prevent the buildup of lint that occurs in dryer vents. 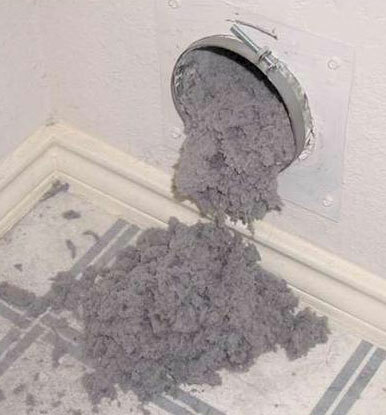 Lint can get around lint traps and accumulate in the venting and dryer duct. The more lint that gets trapped in the vent and dryer duct, the greater the risk of starting a fire. - Clean the lint trap after each load of laundry. *Deep clean the lint filter by brushing with a nylon brush to help remove smaller lint that isn’t easily removed by hand. - Empty the lint pipe every 3 months to keep the vent clear. – If you notice the lint trap is loose or broken, don’t run the dryer. Be sure to replace it before any laundry is placed in the dryer. – Never overload your dryer. – Never leave your dryer running when you’re not home. – Be sure there are no flammable items near the dryer. Hiring an experienced company can help you avoid thousands of dollars in potential damage to property and assets, as well as the possibility of fire-related injuries and deaths. Using special tools, LCS will work from inside and outside your home to clean your dryer vents. We are dedicated to service and safety, and our trained staff will get the job done right! If you have questions regarding dryer vent cleaning or would like to schedule a service appointment, please call is at (417) 883-5220 or send us a message. We’d love to hear from you!